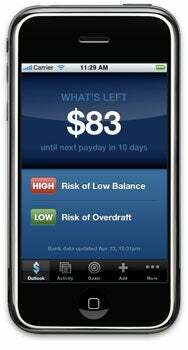 Intuit has released Quicken Online Mobile [iTunes link], an iPhone companion app to the company’s free Quicken Online personal money-management Web service. First previewed at this year’s Macworld Expo, Quicken Online Mobile focuses on a forward-looking view of your money, showing you how much you have left until your next paycheck, for example. It lets you set budgets and keep track of them while you’re out and about, and you can enter cash purchases on the go to track spending, among other features. For those worried about security, Intuit says that it doesn’t store any of your financial passwords (your Bank of America login information, for example), and the Quicken Online Mobile app uses a four-digit passcode for added protection on your iPhone. The app also includes an integrated ATM finder that uses the iPhone 3G’s GPS capabilities to help you find nearby places to get cash at ATMs that won’t add a surcharge. You can also enter a zip code to search for ATMs, which lets users of the iPod touch and older iPhones use the feature as well. Quicken Online Mobile only works with Quicken Online, and requires iPhone OS 2.2.1 running on an iPhone or second-generation iPod touch.